Home/Banners & Signs, Printing/Wall Decals for Kids: How to Decorate Your Child’s Bedroom With Stickers! Wall decals can make a kid’s room go from bland to fun! Read this wall decals for kids guide and know how to decorate their room with stickers. Did you know that the home decor market is worth approximately $65.2 billion each year? When it’s time to redecorate your kid’s bedroom, the cost can be extremely high. And with kids changing their whims and fancies so often, it can be hard to keep up. One day they love trains, the next they’re crazy about Spiderman. But there are ways you can decorate your kid’s bedroom on a budget. One great way is to use wall decals for kids bedrooms. Wall decals and stickers are a sneaky way of updating a room without having to repaint or wallpaper the entire room. 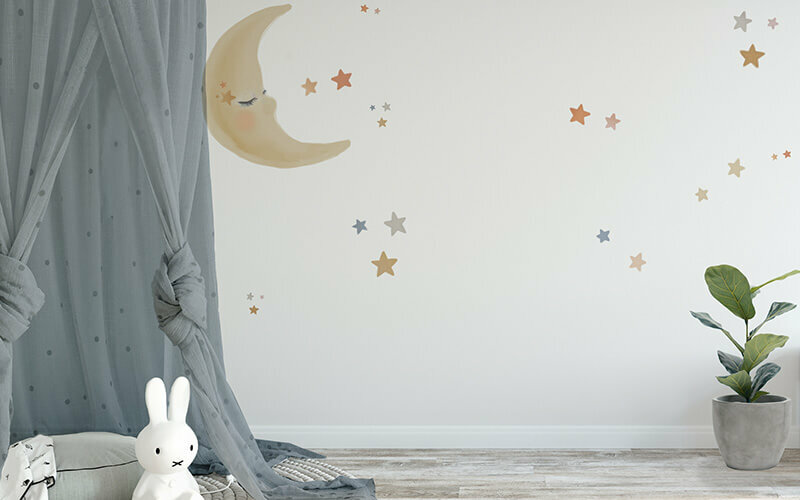 How can you use wall stickers for kids bedrooms? Read this guide to find out. Wall Decals for Kids — What’s the Deal? Vinyl stickers are the best option for kids wall decals as they are durable and reliable. They can last up to 7 years. And you can even use them outdoors. You don’t need glue to apply the decals. And when your ever-changing little one grows out of the design, you can just peel it off. No wallpaper scraper required! Kids wall decals can turn your room into ANYTHING you desire. You can use a single wall sticker as a focal point. Or you can use several small stickers to create an overall theme. There are several different ways of decorating with stickers. Read on for some of our favourite ideas. Use funky letters to emblazon the walls with words. Whether it be your child’s name, a special word or an inspirational phrase, it will personalise the room to your child. Another cool idea is to use letter stickers to differentiate spaces. For instance, if your kids have to share a room, use letter stickers to define the space. This will help siblings to respect their boundaries, especially if there is a big age gap. Hanging wallpaper can be an absolute chore. First, you have to remove the old stuff, then you have to prepare the walls thoroughly. Then you have to hang the wallpaper, which is a huge task in itself! Forget the wallpaper and fake it instead. You can use stickers to repeat the same decal over and over in a pattern. It’s a really clever way to fake the effect of wallpaper. You can even repeat small stickers to create a room border instead of a full wall. If you’re always moving furniture around and sprucing things up, then you’ll love this seasonal idea. Create a wall sticker that looks like a tree. Update the tree as the seasons come around. Bright green leaves and blossom flowers for the spring, and fall colours for the autumn. This will keep your child’s room looking fresh all year round. Before your little one has formed their own opinion about what their favourite things are, you can use cute stickers as decoration. Charming bunting is the perfect decor for a newborns bedroom. Real bunting on a string can cause a danger if it hangs too close to the babies cot. But a bunting sticker on the wall will pose no danger and will look super cute. One of the best ideas for playroom wall decals is to use the stickers as a teaching aid. Alphabet themes aren’t restricted to school classrooms. Use funkily patterned letters to create an alphabet wall for learning and decor. Or get them excited about nature and history with educational wall stickers. You can even get scientific and add a huge dinosaur decal. Not too scary of course! Are you still measuring your child’s height with pencil marks on the wall? Why not use a height chart wall decal instead. It will look a lot better than those grubby pencil marks on your wallpaper. Or use speech bubble stickers or pictures to give reminders around the room. For example, “Put your toys here”. This is an awesome idea for toddler wall decals, as it can help them to remember what goes where. One of the best ideas for kids wall decals is to incorporate their favourite characters. It might be Elsa from Frozen or Buzz Lightyear from Toy Story. Whoever it is, your kid will love having a larger-than-life character hanging out in their room. Instead of choosing something random, why not create a scene instead? Tell a story through graphics. For instance, a popular fairy tale. You can even create a backdrop that your kids can use for play. For instance, a woodland scene. Your kids can use moveable character stickers to send them on adventures. If you don’t want to stick anything onto the walls, why not dazzle the room with stickers on furniture. You can change up a plain old chest of drawers with customised stickers. For instance, stickers that make it look like it’s a DJ turntable. Or, use stickers on your kid’s wardrobe to look like a princess castle. Another cool idea is to use a wall decal instead of furniture. You could use a chandelier sticker to create the look of an elegant room, without forking out on an actual chandelier. Or if your child’s bed doesn’t have a fancy headboard, create one with a sticker. It’s a cheaper option but can look really professional. There are hundreds of ready-made stickers you can use as wall decals for kids. But many read-made stickers are very generic. Instead, why not opt for a company that lets you create something one of a kind? Your unique stickers can be specially made in the style, colour, and size that you want. If you’re full of ideas, click here and we’ll bring your dream sticker to life.